It's hard to believe that World Tapir Day is about to be celebrated for the eleventh time. What started out as a random thought and a post to a tapir group on Google Groups (now sadly long-since deleted) in late January 2008, WTD has become an event that is celebrated around the world every year, and has hopefully contributed to the increased awareness of tapirs and the threats that they face. WTD was always meant to develop a life of its own. It was never meant to be a centrally-controlled event, but rather develop organically as more people and organisations became aware of its existence and adopted it as their own. There have been many highlights over the years, about which we had no forewarning. Discovering the countries in which events have taken place (25 at the last count), and the media coverage that WTD has received is a real source of enjoyment each year. The most important aspect to WTD has been spreading the word about tapirs. Maybe tapirs would have received more coverage anyway, but I'd like to think that WTD has helped to increase their profile at least a little, and provided a focus for others' activities. Being interviewed on Australian and Swedish radio, Yahoo! News, and others. WTD has also raised funds for the World Land Trust and Rainforest Trust, and provided inspiration for others to also raise funds for both organisations, as well as other organisations. Looking back, I feel it's fair to say that the initial concept of WTD has been met, and it continues to grow and receive more coverage. Here's to the next ten years of World Tapir Day and spreading the word about how wonderful tapirs are. As World Tapir Day approaches for 2018, we remember Suzanne Davenport, who passed away suddenly on 10 November 2017. Suzanne was a longtime supporter of WTD, and probably the most active of supporters worldwide. She brought flair along with her passion to her promotional and fundraising activities. She first contacted WTD in 2011 to let us know about her busking activities in the New York subway with her group The Violin Femmes, and each subsequent year became more prolific in envisaging new ways to increase the profile of tapir conservation and how to fund it. Her passion for tapirs stemmed from much earlier - from first seeing them at the Wilhelma Zoo in her native Germany in the early 1990s. Last year she was excited to learn that the zoo was just about to host its first tapirs for some years. In 2017, Suzanne organised the second "Tapir Aid" concert in a bar in New York, at which tapir-themed songs were played, raffles were held, and t-shirts were sold. Well over US$6,000 was raised to support Rainforest Trust projects in Peru and Tapir Specialist Group (TSG) activities. In 2016, Suzanne raised in excess of US$4,000 to protect tapir habitat in Sumatra, Indonesia. As soon as WTD 2017 was over, she was starting to explore new ideas for 2018, and was excited about each new concept she imagined, and shared them with excitement and passion. Her passing came as a shock to the people that she was looking forward to meeting at the seventh International Tapir Symposium in November 2017 in Houston. She was looking forward to meeting the people who had supported her fundraising activities over the years, as well as the tapir researchers her activities had helped to fund. She was both excited and nervous about having a fifteen-minute slot to talk about her fundraising activities, and to motivate them to follow her lead and create activities around the world to help protect tapirs. To celebrate the tenth anniversary of World Tapir Day, Suzanne was working on ideas to expand her activities to Germany through friends in Berlin, and involving bars and breweries in the United States and Germany for fundraising for tapir-related conservation causes. In the weeks before her passing, she and I were in regular contact about how WTD could be promoted more effectively, and how she could be an even more prolific fundraiser. Her fundraising for Rainforest Trust saved almost 4,000 acres of rainforest to protect tapir habitats, not to mention her activities for the TSG and other groups. We will miss Suzanne's enthusiasm for protecting tapirs, and the creativity she brought to her activities. World Tapir Day is poorer for her passing. She may have blamed us for making her passionate about tapir conservation, but the truth is that Suzanne's motivation and excitement for protecting tapirs left most of us looking pretty pale in comparison. If you'd also like to remember her this WTD, a memorial fund is raising funds to support Houston Zoo's tapir conservation activities. Dudley Castle ruins - it was not rebuilt after the fire in 1750 that destroyed it. Trainee Zookeeper Josh Luxton and Chico - "Cheeky Chico" to his friends. Ever wondered what a tapir eats in a day? This is Chico's daily menu. Sarah and Anthony, your UK and Australian WTD people, with Chico. At the end of May, Sarah and I visited Dudley Zoological Gardens (DZG) in the British West Midlands. For the two of us, it was our first meeting: although we've known each other for many years online, we'd never met in person. As WTD's UK-based person, Sarah is much more local to DZG than I am (I live in Australia). DZG has participated in WTD activities for some years, having hosted its first celebration in 2010, and for the last three years. It's understandable that they have been so active: DZG has a very successful Lowland tapir breeding program. At the time of our visit, Meena had given birth to her sixth calf only three days beforehand. The calf's birth was still secret, and almost nobody had been able to see her yet. Whilst we were also unable to see her, it was a privilege to be let into the secret (and be sworn to secrecy to keep it a secret until the official announcement!). At the time of our visit in late May, DZG had just celebrated its 80th anniversary. It is located in and around the ruins of an 11th century castle, which burned down in 1750. Much of DZG's grounds is heritage listed, which makes modernising animal enclosures a challenge as they cannot be modified in any significant manner (even down to the colour of the paint that may be used). In addition, the historical lack of financial support from the British Government also makes the upkeep of the castle ruins and enclosures and expensive undertaking. Working within such confines is challenging for DZG and its staff, but one that it is taking on with relish. It has recently been successful in obtaining £1.15 million grant from the Heritage Lottery Fund for restoring the tectons and other buildings, has been successful in obtaining a £4.5 million from the European Regional Development Fund in 2011, and has undertaken a fundraising campaign as part of its 80th anniversary celebrations. It is an exciting time for DZG, and the efforts that its staff have made in recent years are clearly visible. DZG plans to house animals as appropriately as possible to improve their welfare. This includes steps to ensure that smaller species are housed in enclosures that once housed much larger animals, so that the restrictions of the heritage listing is reduced as much as possible. Where possible, smaller enclosures have been merged to form larger ones, and there is a long list of future improvements planned. Through the greater use of plants, animals will have greater privacy, whilst balancing the expectations of zoo visitors. Sarah and I were warmly hosted by Assistant Curator Jay Haywood and Trainee Keeper Josh Luxton, both of whom spent much of their day hosting us. It should come as little surprise that the highlight for both of us was spending a lengthy time with Chico, father to new calf Luna, and who turned fifteen a few days after our visit. Chico also did not object to the extra attention that he received - there cannot be many tapirs in zoos that do not enjoy having their stomachs rubbed! Aside from spoiling a much-loved tapir, we were also able to discuss Dudley Zoo's fantastic support for WTD, and how it can evolve in future years, as well as how DZG can further increase the profile of its tapirs (it already does a pretty decent job with many news stories about them). Since returning to Australia, I did enjoy seeing that our suggestion for naming Luna was used to great effect! Both Sarah and I are extremely grateful to Dudley Zoological Gardens - and in particular to Jay and Josh - for the extremely warm welcome we received during our visit, and look forward to closer collaboration in the future between DZG and WTD. WWF Peru. Peru had its first ever WTD event in 2017! It's been another busy World Tapir Day around the world - the tenth one! The years since the first one in 2008 have raced by, but in this time it has grown from its humble beginnings to a worldwide celebration of tapirs. It's grown so much that we struggle to keep up with everything that happened! There have been a few really special highlights, including the first ever event in Peru . This is particularly special because it took place in a country that is home to two species of tapirs (the Mountain tapir and Lowland tapir), and whilst we feel that everybody should learn about tapirs, it's particularly important that people who live where tapirs are found in the wild learn as much as they can about them. If they don't take an interest in tapirs (and the environment more broadly), there won't be a future for tapirs in the wild. Sweden also saw its first ever WTD events! Social media coverage was non-stop, and on Twitter #WorldTapirDay was the 4th-highest trending topic in Malaysia at one stage, and the 5th-highest in the United States! The BBC's Discover Wildlife magazine ran a piece, amongst other mainstream media outlet coverage. At the time of writing, event reports are still coming in, and some events are yet to happen. This is what we know about so far - if we've missed anything, please let us know so we can add to this list. What should be the focus of World Tapir Day? One of the challenges that we - "we" being the small group of WTD volunteers - faces is deciding what we communicate with you, our fellow tapir fans, about tapirs. It's no secret that our most popular posts throughout the year generally involve a video or series of photos of a newly born tapir. And that's no surprise, let's be honest - who doesn't like a baby tapir, or a video of a tapir being tickled and groomed? 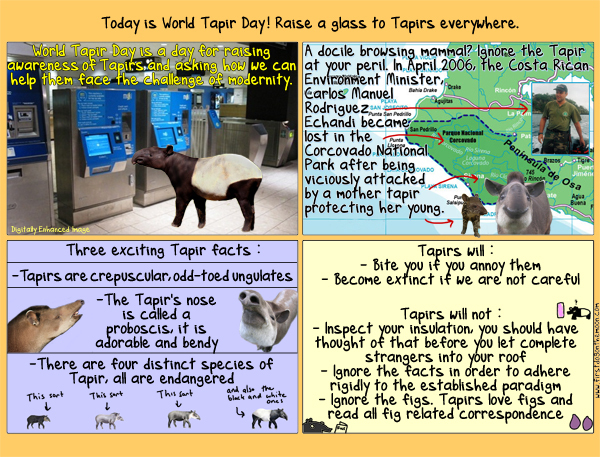 Sometimes a post on 27 April, World Tapir Day, attracts more publicity than we'd ever dreamed of in WTD's first year in 2008. So much pressure for such a little tapir. It's hard being so sweet, and we feel the pressure at times too (even if not for the same reasons). Every now and again, we post a link to an article about issues that pose serious threats to the longterm survival of all four extant tapir species (not to mention to individual tapirs). Two recent confronting examples are this post from the Malaysian Nature Society and another from Patricia Medici, President of the Tapir Specialist Group (NOTE: the links are confronting and contain disturbing reports about tapirs). When we share such reports, we do so in the knowledge that some readers will find the reports upsetting - as do we. We share them with the best of intentions. We are firmly of the view that, regardless of the how confronting the reports and accompanying images may be, it is important that such information is shared. Part of our passion for tapirs is also about raising awareness of the threats that they face, and this includes reports that we wish didn't have to exist. But we know that not every supporter of WTD feels the same, and we've come in for criticism after some of some our posts on our Facebook and Twitter pages. We acknowledge this criticism and do take it to heart. It isn't as tapirs are the only species that face similar issues. If you read news about rhinoceros conservation, the horrendous reports of poaching seem to be the predominant theme, and it can be difficult to find anything positive amongst the massive losses every year. But World Tapir Day isn't just about what we think is important. The strength of WTD is the sense of community that has developed to support WTD's goals, not to mention share our love of tapirs. Part of the responsibility that we feel towards you is knowing how you feel about this topic. So please tell us below: should we continue to post the occasional distressing report, or should we only focus on the positive side? The 2016 edition of World Tapir Day has been. Once again, we greatly appreciate to the people and organisations who made World Tapir Day so successful in 2016. Without your efforts and engagement WTD would not be able to exist, and raise awareness of tapirs and the threats that they face. Badan Warisan Malaysia (The Heritage of Malaysia Trust) started the celebrations with an education event in Kuala Lumpur (left). The Zoológico Municipal de Guarulhos in Brazil held its first event. Every new event to celebrate World Tapir Day is wonderful, but they are especially fantastic when they occur in countries in which tapirs are found in the wild. It's in their home ranges where tapirs need as much help as they can get, and every piece of publicity is a step forward in the campaign to raise the awareness about them. The Zoologisk Have in Copenhagen held the first-ever WTD event in the country, celebrating with an entire week of events. Hunter Valley Zoo in Australia celebrated the birthday of Berani, their resident Malayan tapir, as part of their inaugural WTD event. The full list of events can be found on our "past events" page, or on our Facebook events page. There was also some great media coverage, including in the New Straits Times in Malaysia, the Telegraph in the United Kingdom, and on the Nine Network's website and nightly news in Australia. We've been a little slack in posting a round-up of World Tapir Day in 2015, but here it is. There is a lot to report and, quite frankly, it has taken time just to work out exactly where events were held, by whom, and what they were. But we think we are there now. World Tapir Day was busy in 2015, with a wide range of events taking place around the world, media coverage and online activity and discussion reaching levels never previously seen before. It was hard to keep up with it all, but we've done our best to summarise it for you. We are so grateful to the people and organisations who made World Tapir Day so successful in 2015. Without your efforts and engagement there is no way that WTD could have grown to the level that it has. Events took place in fourteen countries on five continents (full list, as far as we are aware of them, below), as well as some great coverage online. Leading the way was Japan, with events marking WTD taking place at ten zoos across the country - the most events in a single country in a year so far! Longstanding supporters of WTD, the Adelaide Zoo, celebrated WTD for the sixth straight year with keeper talks and information tables. The Belize Zoo, which has been part of WTD since its inception in 2008, again marked the day in conjunction with its Belizean National Tapir Day celebrations that has been celebrated since 2011. Centre to the Belize Zoo's events was Fuego's second birthday party. Tapir artists were at the fore at CERZA in France, creating artworks for auctioning to raise funds for tapir conservation. Elsewhere in Central and South America, Honduras saw its first event with an information stand in La Ceiba run by Grupo Pro-Tapir. Brazil also had its first WTD event with the Parque das Aves in Foz do Iguaçu, and the Zoo Córdoba celebrated across the border in Argentina. Other countries that saw their first events marking WTD were Italy and Taiwan, where the Taipei Zoo linked WTD activities with Earth Day and celebrated across a two-week period! Malaysia was host to an art exhibition at the Penang Performing Arts Centre (PenangPAC) of hundreds of Malayan tapir figurines made by schoolchildren across the country as part of the Tapir 2015 exhibition. The Department of Wildlife and National Parks, PERHILITAN, ran a campaign to make Malaysian drivers alert to the dangers faced by tapirs trying to cross roads in the country. This is particularly significant, given the large number of tapirs (and other species) killed on Malaysia's road annually. In Malaysia, on the other hand, the artists were more conventional, with Tapir 2015 exhibiting art from the country's leading young artists. 3rd-highest trending topic in the UK for much of 27 April! Who says tapirs are niche? For much of the day, WTD was trending in the top three topics in the UK, eventually being seventh overall for 27 April 2015, having trended for over 5 1/2 hours - not bad going, by anyone's account. Regular posts by the IUCN, the Malaysian Nature Society and Greenpeace were especially pleasing to see. Globo and National Geographic (Brazil), Irish Examiner, the BBC and Metro (United Kingdom) and The Age (Australia) were some of the media outlets that covered World Tapir Day in various formats. Perhaps the highlight of the day was the fantastic infographic from Peppermint Narwhal. By the time we'd made it out of bed early on the morning of 27 April in Australia, the image had already circulated widely across Twitter (so much so that we initially missed the source!). If you didn't know your tapirs beforehand, there are no excuses now! Another 27 April is here, which means that it's now World Tapir Day - the eighth WTD since its inception in 2008. World Tapir Day is being celebrated at events in at least eleven countries in 2015. Ten Japanese zoos have hosted events to mark the occasion, as have zoos in other Asian countries, and across Europe, North America and Australia. Particularly special is always the World Tapir Day celebration in Belize that coincides with the country's National Tapir Day at the Belize Zoo. There will be other events happening, some of which we'll learn about only after the fact. Our Facebook page has the full list of events on it. Happy World Tapir Day everybody! We hope you are having a wonderful day. The history of motoring and tapirs aren't an obvious area of commonality. Countless thousands of tapirs have been injured and killed by the increase of roads and traffic that cut across their habitats. But over 45 years ago, tapirs served as inspiration for one of Porsche's most attractive concept cars, the Porsche Tapiro. The car was based on the Porsche 914/916 platform and its most notable feature was the double set of gullwing doors - one set for the driver and passenger, and one set for accessing the storage area above the engine. The observant will have also noticed a Volkswagen badge on the front of the car: this concept car was not the only foray of joint VW-Porsche activity; indeed, the close connection between the two marques continues. The Porsche Tapiro, despite being a concept car, was actually a fully functioning car, thanks to its 914 base. After the car had served its life as an exhibition piece, the car was sold to a Spanish industrialist in 1972, who used it as his daily drive until around 1980. The car was destroyed during an industrial dispute involving its owner - allegedly by employees of the industrialist's company, who blew it up with an explosive device placed under it. The wreck was purchased by Guugiaro's company Italdesign, where it remains on display in its unrestored state. Created by Italian designer Georgetto Giugiaro, who was named as the Car Designer of the Century three decades later, the Porsche Tapiro was a concept car produced for the 1970 Turin Motor Show exhibition circuit. Described as the first example of his influential "folded paper" style that featured in later car design (such as the DeLorean made famous in the Back to the Future films), Giugiaro named the car after the tapir because he felt that the design resembled it.